On Sale Now! Free Shipping Included! Save 4% on the Carlisle 4122000 Sparta Spectrum Jumbo Tank Brush, Plastic Block, Nylon White Bristles, 10-1/2'' L x 6'' W (Case of 12) by Carlisle at Blog Free Here. MPN: 4122000. Hurry! Limited time offer. Offer valid only while supplies last. The Carlisle 4122000 Sparta Spectrum jumbo tank brush with white bristles has a flare head for even cleaning of curved surfaces in a jumbo tank. 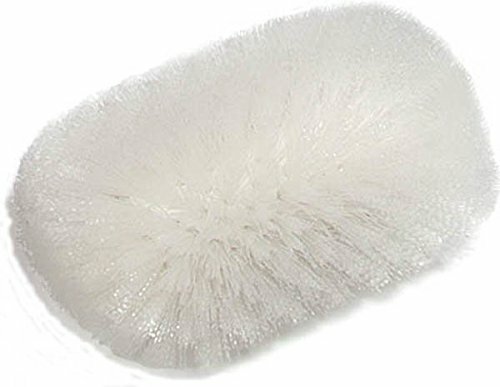 The Carlisle 4122000 Sparta Spectrum jumbo tank brush with white bristles has a flare head for even cleaning of curved surfaces in a jumbo tank. Durable nylon bristles offer excellent chemical resistance. The white block is made of plastic for durability and has three threaded holes that accept handles of varying lengths (sold separately) at different angles. The base resins used for the block and bristles are U.S. Food and Drug Administration (FDA) approved. All brush material is free of BPA (Bisphenol A) to address safety concerns raised by the U.S. FDA and other organizations. The overall dimensions are 10-1/2 x 6 inches (length x width).